Evidence of a Native American tribe called the Antones, who belonged to the Tuscarora Nation, may have been the builders of a mound on 2 1/2 acres, called Fort Hill in Oxford. The remains were noticed when Oxford was first settled in 1788, and is one of the oldest fortifications in the east, dating back to before the discovery of this country by the Europeans. The strategic location of the hill provided an unobstructed view up and down the river. The Fort area was semi-circular, about 30' high and enclosed about 3/4 acre of birch and maple trees. An old Oneida oral tradition told of a terrible enemy chief called "Thick Neck" of the Antone tribe, which dated back seven generations to Fort Hill. 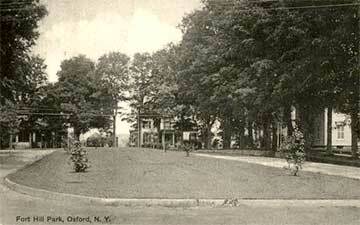 (Documented in the 1906 "Annals of Oxford, NY", by H.J. Galpin.) Thick Neck had fought with the Oneidas, but finally they defeated him by Lake Warn (then called Warn's Pond). After his death, Thick Neck's leaderless tribe joined with the Oneidas. Human bones, ancient earthern cooking utensils and other relics were found when excavations were made at Fort Hill. In October, 1897, while workmen were engaged in trenching the village for the water works, they uncovered parts of two skeletons in the road near the crosswalk west of the Congregational church (known today as the United Church of Oxford).